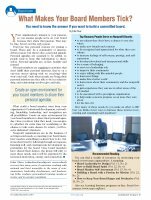 Home > Membership > Nonprofit World > What Makes Your Board Members Tick? What Makes Your Board Members Tick? You need to know the answer if you want to build a committed board.